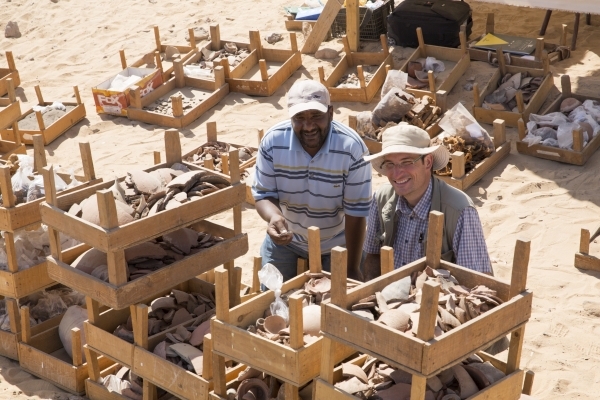 Just about 1 km northwards of the main necropolis of the Qubbet el-Hawa on the Western Nile bank a sandstone plateau is located, which is partly surrounded by the modern Nubian village. On this hill and the surrounding neighborhood, the people of Aswan-Gharb started to enlarge the village and to build further houses. During this situation the resident population has detected some new tombs and plundering activity had started shortly after. As a matter of fact objects and parts of delicately decorated architectural elements (like the architrave in the tomb of User) have been stolen and brought to the nearby houses. The plunderers used loaders to penetrate into the site and deposited the rubble and the sand in front of the tombs. During these activities some of the architectural features were severely damaged. 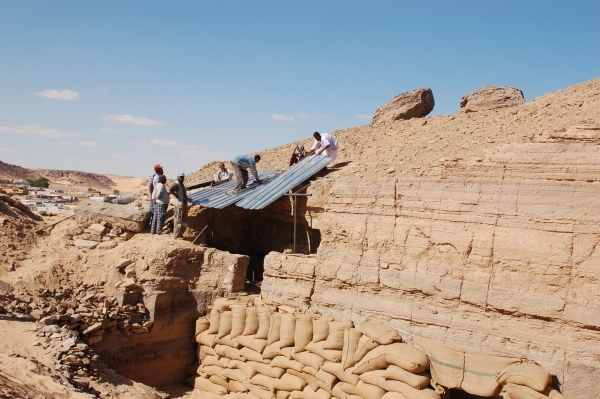 In 2013 it was due to the remarkable intervention of the Aswan inspectorate, that these plundering activities were stopped and a first attempt to secure the tombs had been undertaken. The whole place had been assigned as antiquities land which led to the protection by the Ministry of State for Antiquities. Most of the stolen objects, including the architrave of the tomb of User, have been seized and transferred to the central storerooms. The tombs themselves got stable iron doors for a safe protection. In June 2014 a first short season by the Aswan inspectorate took place under the guidance of O. Amer and H. Alders. During this season a first attempt was made to clear the situation in the plundered tombs and the documentation of the small finds and some pottery started. 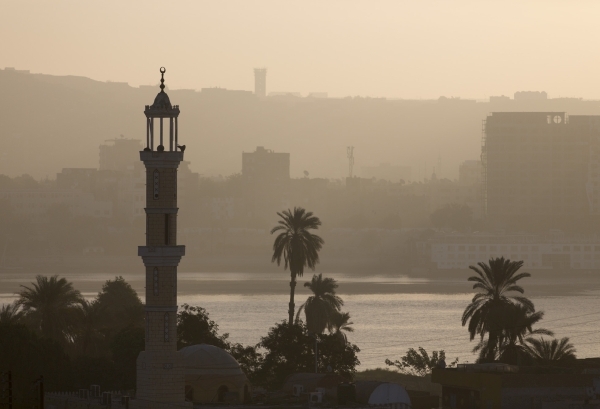 While securing the most prominent tomb of User, other sepulchers have been found by the Egyptian authorities. 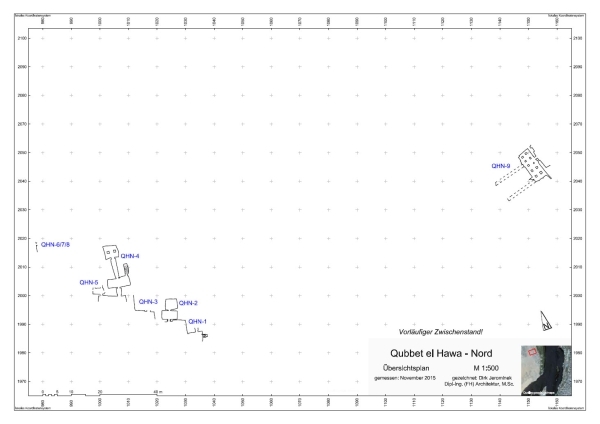 All in all nine tombs are known so far: The mostly belong to persons of the highest elite of the early New Kingdom — Ramesside period (map). 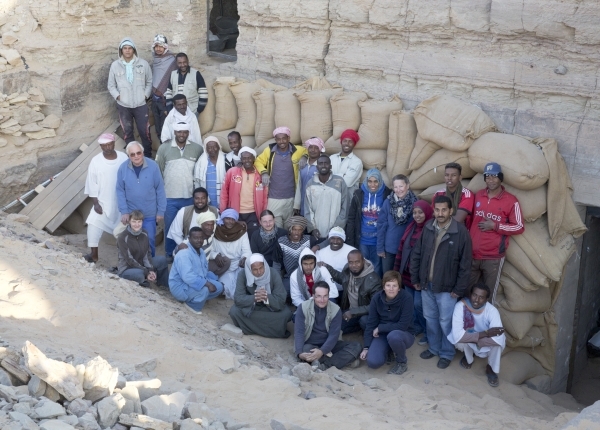 In spring 2015 the High Committee of the MSA/SCA permitted the formation of a bilateral cooperation between the members of the Aswan-inspectorate and the Ägyptisches Museum & Papyrussammlung Berlin for the safeguarding, protection and complete documentation of this northern part of the necropolis: The Egyptian-German-Mission: Qubbet el-Hawa North. After 100 years of absence, the Ägyptisches Museum und Papyrussammlung Berlin is therefore again involved in the country of its main interest with an excavation project. 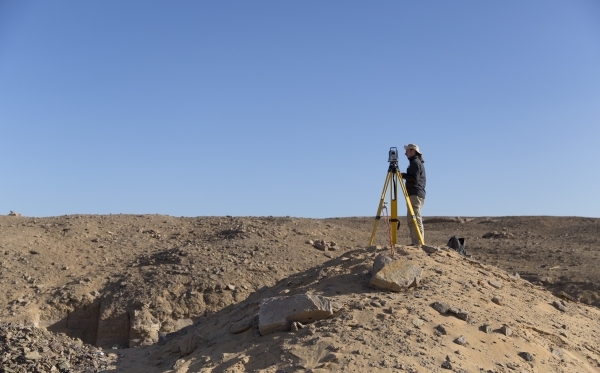 Financial support for the first season of the rescue excavation in autumn 2015 was generously submitted by the “Förderverein des Ägyptischen Museums e. V.“ as well as by the Deutsche Forschungsgemeinschaft (DFG) [German Research Community]. During the first season in October and November 2015 it was important to get a first overview on the new necropolis. Measurements of the whole area were undertaken to get a detailed map of the necropolis as well as plans of the tombs themselves. 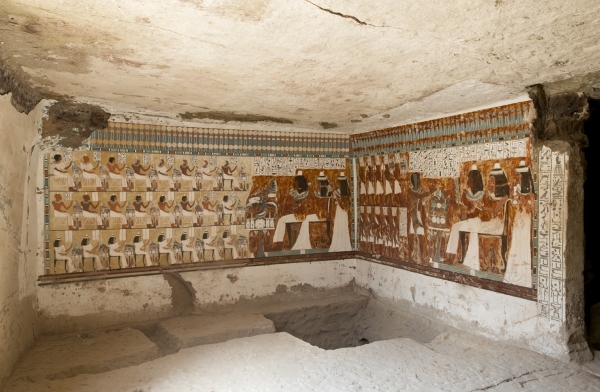 The New Kingdom tombs in the South-West of the necropolis were therefore in the focus of the first season. These tombs suffered most during the mutilation by the looters. The latter left spoil heaps in the courtyards of the very tombs which had to be removed and sieved carefully. This tomb, constructed during the Reign of King Amenhotep III. In the 18th Dynasty, was in the focus of the tomb looters. Besides the removal of objects, the inscribed architrave in the second room, had been broken out. The latter is now in the magazine of the Antiquities Department and will be replaced after the completion of the excavation inside the tomb. During the first season the rooms, filled with debris and rubble were cleaned and documented and a big part of the spoil heaps in front of the tomb was removed. The finds such as papyrus-fragments of a book of dead, a certain amount of mostly broken pottery were documented. The beautifully wall paintings were photographed for further detailed examination and the two main rooms of the substructure have been measured to draw an accurate plan of the tomb. During the next season, parts of the courtyard will be cleaned as well as the shaft in room 1 will be excavated. 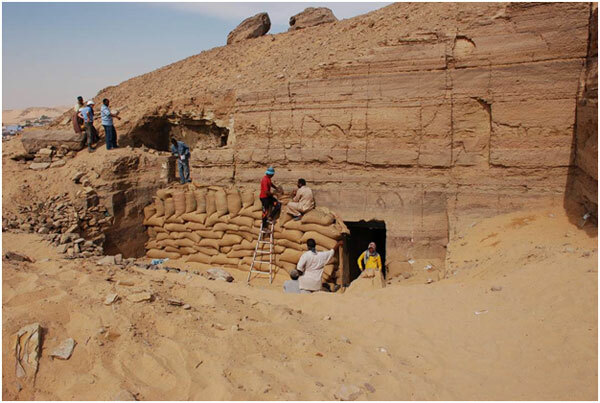 All the finds and archaeological features will be prepared for a detailed publication of this tomb by the Egyptian team-members of our Aswan colleagues in a newly established publication series of the MSA/SCA. A bit to the north of the tomb of User is situated the complex of a Major of Elephantine, Imen-hotep, which can be dated stylistically to the beginning of the 18th dynasty, most probably to the reign of Queen Hatshepsut and Thutmosis III. This tomb is much bigger than the first one and has a façade which shows inscriptions and decoration in a high quality. The original dimensions of the courtyard are not known so far and have to be documented in detail during the next seasons. As the sandstone façade is in danger because of possible vandalism and climatic conditions — especially the damage through sand and wind —, the mission decided to protect the facade by a blocking with sandbags. Before the complete covering, a photographic documentation of the whole façade was made. 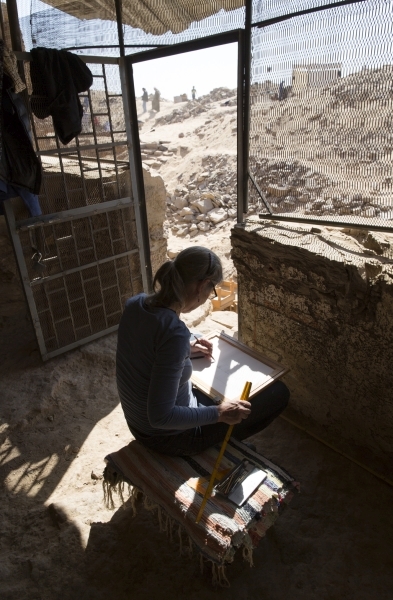 Even though the rooms of the tomb are not excavated yet, the measuring and drawing of the tomb's plan has been started to get a first overview. 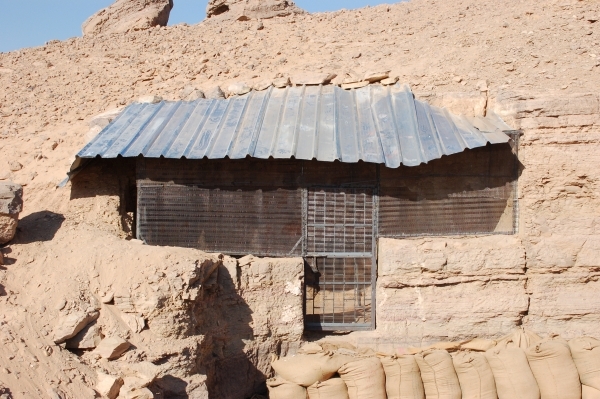 Above the façade of QHN 4 — in the northwestern corner of Imen-hotep's tomb — a small rock cut tombs was constructed, after shifting sands and rubble had covered the complete courtyard of the older 18th dynasty tomb. 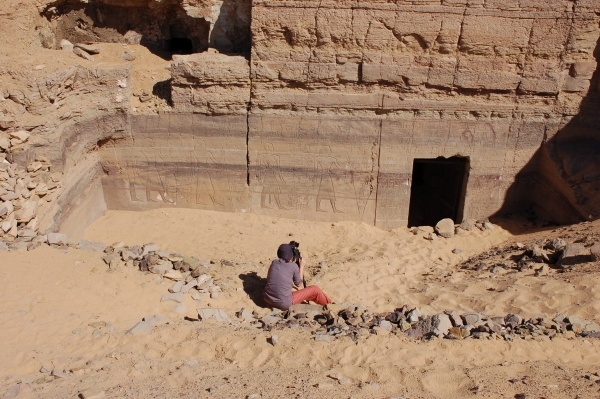 Due to stylistic and epigraphic reasons the tomb can be dated to the Ramesside period. 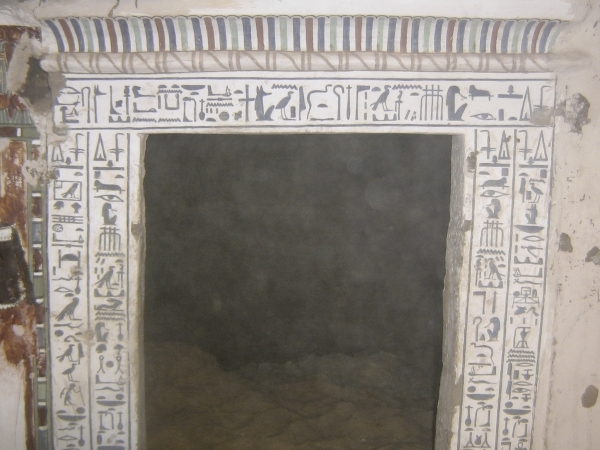 The decoration has been painted in a very typical Ramesside style on a thick layer of muna plaster, which had been whitewashed with a limy plaster, which served as the painting surface. The ceiling of the first room does not exist anymore so that the decoration was exposed to the weathering conditions, which harmed it at lot. Additionally termites had eaten the straw material within the mud plaster of the walls, so that many parts of the painted surface suffered. To secure the wall painting the first room was cleaned from the debris, while disturbed secondary burials of the New Kingdom containing shabtis, beads and pottery were excavated. After the documentation of this room a protection with a metal construction and a coverage to secure the entrance situation have been installed. In the next seasons a full epigraphic documentation of the wall paintings and a further excavation of the next rooms are planned. We would like to thank the DFG (German Research Community) as well as the “Verein zur Förderung des Ägyptischen Museums Berlin e.V.“ (the “Friends of the Museum“) for the generous funding of our first season. Additionally we would like to express our thanks for their kind support to Dr. F. Arnold and Dr. J. Siegl from the German Archaeological Institute as well as to Prof. Dr. A. Jimenez-Serrano from the Universidád de Jaén.